I never read the ending before I start a book or skip ahead to the end while reading the book. I’m actually really careful to make sure I don’t glimpse the final words by some accident. Although most books don’t tell you how everything turns out in the last page, I don’t want to spoil anything for myself! I think a book’s ending is really important and leaves an impact on you that is affected by your experience reading the entire book. The ending won’t have the same emotional weight if you read it before getting to know the characters and their struggles, and I would hate to taint my own reading experience by learning those final words before I’ve immersed myself in the story. What about you? Do you ever read the end first, or do you read strictly from beginning to end? When Will Schwalbe’s mother was diagnosed with pancreatic cancer at a “treatable but not curable” stage, he began accompanying her to her chemo appointments. Spending hours together at a time, their conversations drifted naturally toward one of their favorite topics: books. 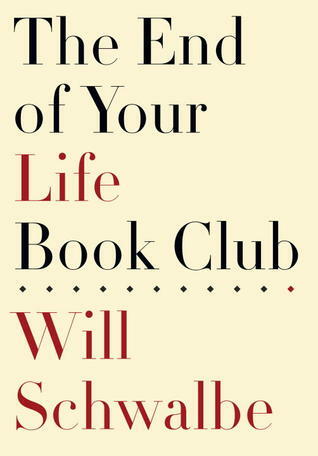 Thus, the End of Your Life Book Club was formed. Honestly, I had never heard of Cloud Atlas before I saw the 6-minute trailer a few months ago. However, the trailer looked fascinating, and I quickly resolved to read the book before the movie came out. Although I loved the book, I had some mixed feelings about the movie when I saw it last weekend. It’s election day in the good ol’ U-S-of-A, and it is our responsibility and our privilege to vote. Thousands of men and women have fought and died and made incredible sacrifices to give us (all) the right to vote, so instead of complaining about our political system and electoral process, we should get out there and make our voices heard! Use that glorious right our predecessors fought so hard to give us and participate in our government! Go, vote! What are you waiting for? Get thee to thy polling place!